Conflict(s) of interests run as rampant in the wine world as almost anywhere else, besides the intertwined upper echelon of government and industry. Many reviewers make it a point to make known their connections to wines reviewed and many more are slammed in the blogosphere for not disclosing such details. In reviewing another Gerard Bertand wine, I feel I should say that, when contacted, Bertand’s rep wasn’t interested in helping to locate and new releases of Le Viala and La Forge, Bertand’s flagship bottles. On top of this, to my request to pre-pay and have some ordered from the same distributor from which they acquire the more modest bottles, BQE Wine & Liquors, with whom I do a fair amount of business replied, “No special orders.” Everyone involved seems to have the same attitude as the Frenchmen who make the stuff: There isn’t very much of it, it’s very good, and it will all sell without much effort on our part. Unfortunately, all of these things are true, and, besides those aforementioned flagship bottles, Gerard Bertand makes a number of very nice wines per dollar spent. 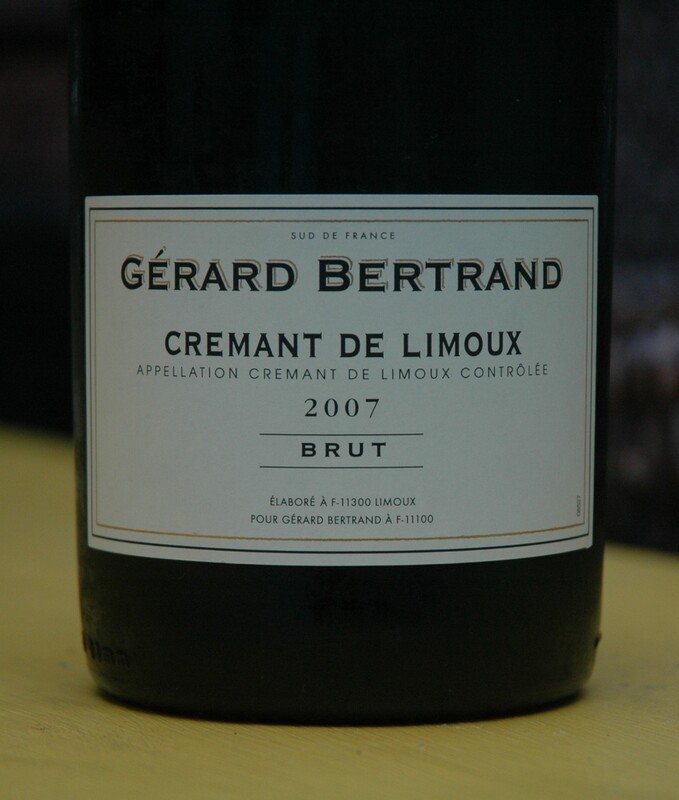 Most recently I tasted Bertrand’s white bubbly: Cremant de Limoux 2007. I was just reading Patti Smith’s Just Kids, about her early days in New York and her relationship with Robert Mapplethorp. Smith’s best known record is of course, Horses (without which there may very well be no Ani DiFranco), which got me thinking about “Wild Horses”. Which lead my ears to find themselves listening to Beggar’s Banquet on shuffle. I’m not sure any other song has such particular visceral connection to a book as does “Sympathy for the Devil” with Fear & Loathing in Las Vegas. Jimmy Buffett’s Margaritaville Records did a stunning old time radio show style reading of Dr. Hunter S. Thompson’s finest work, which predates and outclasses the film, that would eventually follow. Back to Gerard Bertrand Cremant de Limoux 2007. At just under $15 a bottle (from my friends at BQE Wine & Liquor), this delightful bubbly compares quite favorably on the world stage, versus Champagne, Cava, and Prosecco. In the glass, the Bertrand Cremant is very pale yellow, with the faintest green hue, tapering off to almost clear in the very point of the flute. The palate is sweet, lightly honeyed, and light on its feet, but with enough yeast, citrus, and lively acidity to maintain balance. As it breathes, white grape, Bartlet pair, and green apple build on the palate, unusual in its pleasant grapiness. The moderate finish is with the presence of yeast and a texture that’s near powdery. This is a highly enjoyable sparkling wine for its price point and makes nice summer cocktail.